3:38 p.m., Oct. 13, 2005--University of Delaware researchers are opening a new front in the war on cancer, bringing to bear new nanotechnologies for cancer detection and treatment and introducing a unique nanobomb that can literally blow up breast cancer tumors. He is the lead investigator for a team that includes Eric Wickstrom, professor of biochemistry and molecular biology at Thomas Jefferson University in Philadelphia and his student Greg Cesarone, and UD graduate students Shaoxin Lu, Kousik Sivakumar and postdoctoral researcher Kasif Teker. Panchapakesan said this is basic research in the very early stages of inquiry and that it would take extensive testing and years of clinical trials before the nanobombs could actually be used in medical applications to treat human beings. Make no mistake, we are focused on eradicating cancer, Panchapakesan said, explaining that the nanobombs are the result of work over the past two years with carbon nanotubes, which are atoms of carbon arranged in tubular form. 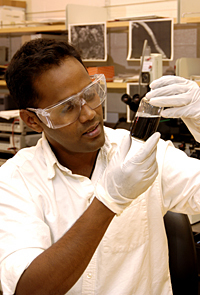 Originally, he said, the research team was looking at the use of the carbon nanotubes as drug delivery vehicles. Because they are smaller than the size of a single cell, the nanotubes can provide for the highly selective injection of drugs into individual cells. Explosions in air of loosely packed nanotubes have been seen before in an oxygen environment, creating ignition. However, the work reported by Panchapakesan uses the localized thermal energy imbalance to set off explosions that are intrinsic in nature. The bombs are created by bundling the carbon nanotubes. 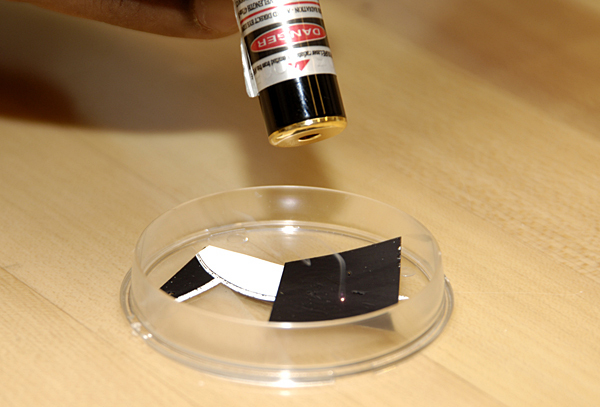 With a single nanotube, the heat generated by the light is dissipated by surrounding air. In bundles, the heat cannot dissipate as quickly and the result is an explosion on the nanoscale, Panchapakesan said. When the UD researchers saw the explosions, they realized it might be possible to use the microscopic bombs to kill cancer cells. They recreated the explosions in solutions including water, phosphate and salt, which meant the nanobombs could be used in the human body. In fact the explosions were more dramatic in saline solutions, Panchapakesan said. He believes the nanobomb holds great promise as a therapeutic agent for killing cancer cells, with particular emphasis on breast cancer cells, because its shockwave kills the cancerous cells as well as the biological pathways that carry instructions to generate additional cancerous cells and the small veins that nourish the diseased cells. Also, it can be spread over a wide area to create structural damage to the cancer cells that are close by. Panchapakesan said the method is far better than modern chemotherapy, which is non-selective, kills normal cells as well as cancerous cells and leads to a decline in the quality of life for the patient. This is valuable in patient management, pain management and overall quality of life, he said. In the future, my vision is that people will have at-home kits that can detect cancer. After work they will be able to go to a clinic, be treated with nanobombs and go home, Panchapakesan said. While these initial experiments are on breast cancer cells, he is also working to extend his method to prostate cancer and pancreatic cancer. Funding for the research was provided in part by the Department of Defenses Congressionally Directed Medical Research Program.